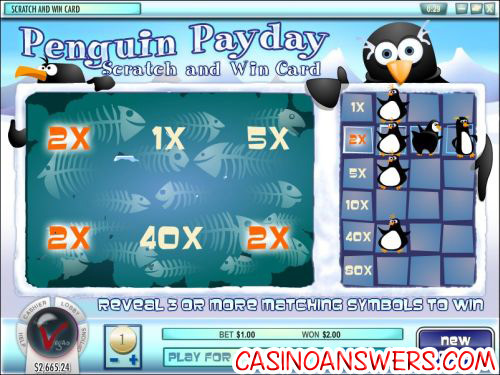 Penguin Payday Scratch Card Guide & Review - Casino Answers! Penguin Payday is a scratch and win card developed by Rival. You can play the Penguin Payday online scratch card at This is Vegas Casino and Pantasia Casino. To play Penguin Payday, we recommend you check out This is Vegas Casino, which offers some sweet scratch card bonuses as apart of their $2400 signup bonus as well as scratch card reload bonuses. Sign up now at This is Vegas Casino! Are USA players able to play the Penguin Payday scratch lottery game? Rival casinos are no longer accepting American players at their casinos. If you’re based in the USA and looking to play an online scratch card, please visit Bovada. What other scratch cards can I play at Rival casinos? Rival casinos such as This is Vegas Casino also offer Gunslinger’s Gold and Tiki Treasure. You can read our Gunslinger’s Gold Scratch Card Review for more on that online scratch card game. How much can I win playing the Penguin Payday scratch ticket? The top jackpot on Penguin Payday is 80X, so if under the highly unlikely chance that you happen to be betting $100 per game of Penguin Payday, you can win as much as $8,000 on Penguin Payday! Can I play Penguin Payday in my browser? Yes, both This is Vegas Casino and Pantasia Casino offer Instant Play versions of their online casinos, which is perfect for Macintosh casino players. If you experience issues with the flash scratch card game, you can install the latest edition of Adobe Flash Player, which should fix any problems you might be having playing Penguin Payday. What rival scratch cards are there?